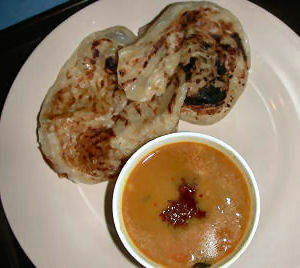 Roti Canai is a form of puffed bread served hot with curry or dhal. Tastes best when taken for breakfast or morning tea; eaten with the hand (the 'right' one of course! ); accompanied by curry or dhal and washed down with strong, hot, sweet kopi-O (Malaysian style coffee). 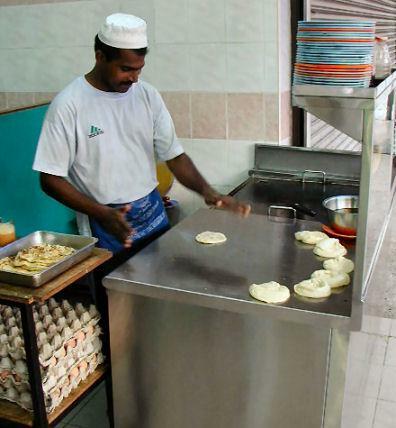 Roti canai or roti chennai is a dish unique to Malaysia, which has its origins lost in the Indian community of those countries. Roti means bread in Hindi (and Malay) The term 'canai' comes from 'channa', a mixture of boiled chickpeas in a spicy gravy from Northern India which it was traditionally served with.